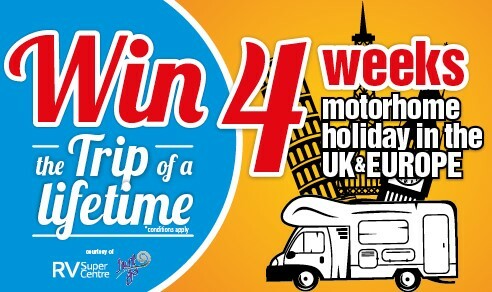 Visitors to next year’s Covi NZMCA Insurance Motorhome, Caravan and Outdoor SuperShow once again have the opportunity to win the trip of a lifetime, a four week motorhome holiday in the UK and Europe. The Covi SuperShow is New Zealand’s largest annual motorhome, caravan and outdoor expo and is being held on Friday, Saturday and Sunday the 17th, 18th and 19th of March at Auckland’s ASB Showgrounds, in Greenlane. A subsidiary of THL, Just Go motorhomes has the largest, self-drive motorhome hire fleet in the UK. Based near London, the company specialises in a range of luxury motorhomes for travellers wanting to explore the UK and mainland Europe, exactly what the Covi SuperShow 2017 gate prize winners will be able to do. Next year’s Covi SuperShow will again showcase the best motorhomes, caravans and accessories from New Zealand and around the world with a number of exhibitors launching new models and products exclusively at the SuperShow. Demand for exhibition space has been unprecedented, with the result that not only will the massive indoor space be completely full but the outdoor display area will be significantly bigger than ever before as well. • The $10,000 Covi Cashback prize – which this year was won by Rod and Margaret Coleman from Hobsonville. The couple purchased a new purchased a new Dethleffs Magic motorhome from Acacia Motorhomes at the show which meant they were eligible for the draw to win a $10,000 cash refund on their purchase price. • The Covi SuperShow is the only motorhome and caravan expo endorsed and supported by the NZMCA which runs a very successful rally which will be on a new site next year, Ellerslie Racecourse. Ellerslie offers ample parking space in lovely surroundings in the centre of one of the country’s most picturesque racecourses, great availability of bars and restaurants on-site, an on-site dump station and even an on-site golf driving range. It’s also easy-to-reach, just off the motorway for out of town visitors and will be connected to the Covi SuperShow venue at the ASB Showgrounds – which is just two kilometers away - by a free all-day bus service for rally-goers. The Covi SuperShow is the only North Island show supported by all the major manufacturers and the NZMCA and the show has built its reputation on such innovative promotions as the gate prize draw.